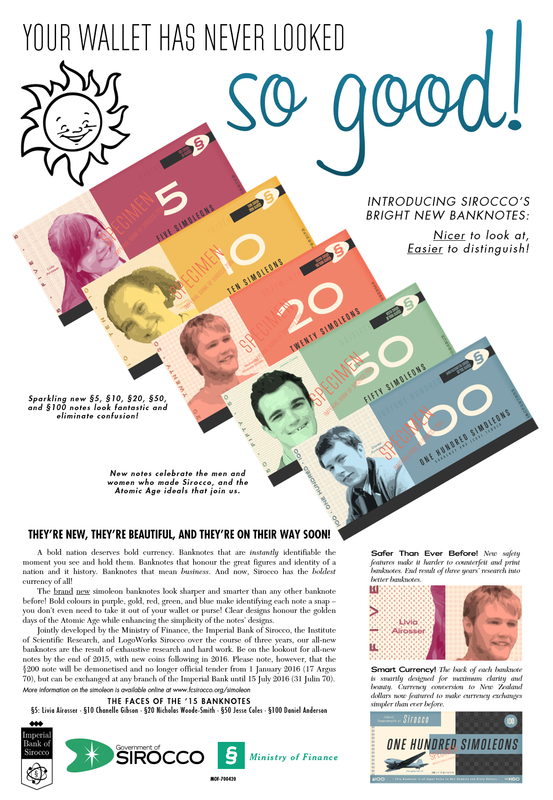 Sirocco uses the simoleon (§, SRS) as its currency, which is unique among micronations as it is not based on a clean 1:1/100 ratio, such as the New Zealand dollar, which has 100 cents to the dollar. Instead, Sirocco uses a decimalised version of the former British pounds, shillings, and pence, which were used in South Africa and New Zealand until 1961 and 1967, respectively. Under this system, there are ten baud (pronounced 'bored') to one shilling, and ten shillings, or 100 baud, to one simoleon. The simoleon formerly used a fully decimal (1:100) system between 2008 (GDR simoleon) and 17 February 2014, when it was replaced by the current 1:10:10 system. Sirocco uses the baud (1b), two baud (2b), five baud (5b), shilling (1/-), two shilling (2/-), five shilling (5/-), simoleon (§1), and two simoleon (§2) coins. Sirocco uses the five simoleon (§5), ten simoleon (§10), twenty simoleon (§20), fifty simoleon (§50), and one hundred simoleon (§100) notes. In the past Sirocco has used §200 and §500 notes, although these were demonetised in 2015 and 2012, respectively. Sirocco's current banknotes, featuring important Siroccan political figures, were introduced on 4 November 2015. Its former banknotes, introduced in May 2012, were demonetised on 31 December 2015. Sirocco generally uses fixed conversion rates between currencies, simply to make it easier to convert. The simoleon is fixed to the New Zealand dollar at a rate of 6/2 to the dollar, or working the other way around, $1.60 to the simoleon. §3 x 1.6 = $4.80. $5 ÷ 1.6 = §3 1/2. One tip when converting is to utilise the space between the shilling and baud. When converting to dollars, remove the divider (be this a space, slash, or so on) between the shilling and baud to change the shillings into baud (4/5 would thus become 45 baud), which makes the sums much easier to work with. An amount such as §12 4/5 is now 12.45, which can be calculated with ease. Likewise, when converting to simoleons, add the divider back in at the final stage. If you convert and have an answer such as 6.13 returned to you, separate the final two figures, and you will have the total in simoleons: §6 1/3. This trick also works when working with pre-reform figures: §9.57 becomes §9 5/7. The simoleon uses a writing scheme very similar to that of the £sd system. Amounts in baud are followed by the letter b, thus an amount for four baud would be written 4b. Amounts in shillings are written as either 2/- or 2s. 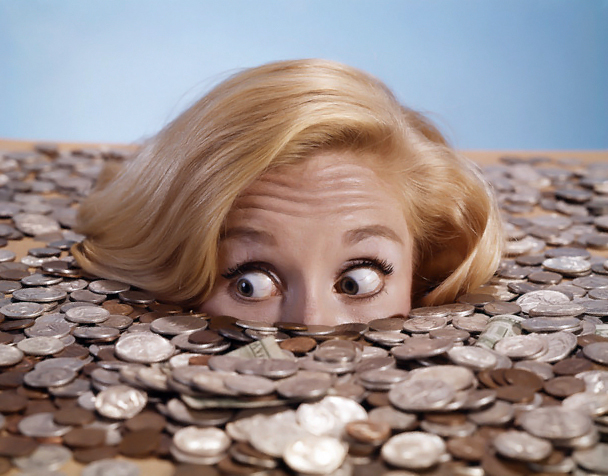 Shillings and baud are likewise written as 3/6, 3'6, or 3s 6b. §7 5'1, §7.5.1, or §7 5s 1b, but the first is the most commonly used. §2 6/- is two simoleons and six shillings. §15 5'2 is fifteen simoleons, five shillings, and two baud. It can seem confusing at first, but don't worry. Once you pick a writing style, you're free to stick with it, since each is as good as the others. And remember, when converting to or from decimal currencies, add or remove the decimal point between the shilling and baud as necessary. But if you want to get really involved with the simoleon, learn the alternative terminology - 'bit' for baud, 'bob' for shilling, 'quid' for simoleon, and 'shilling-and-baud' for units like 4/2 ('four-and-two'). Sure, it might seem silly now, but when someone asks to borrow "three quid nine and six", you know how much they want you to lend them (§3 9/6). Whether they pay you back or not is another story.